At first the title “Reuben Kadish: Works From 1930 to the Present” seems a misnomer. The works look as if they come from way before 1930. Indeed, the newest sculptures look as old as the hills. But a refreshing aspect of the 77-year old Mr. Kadish’s retrospective at the New Jersey State Museum here. through April 15, Ls that his most recent work, sculpture from the 1980’s, is the most riveting. As a sculptor, Mr. Kadish works in clay and bronze, but the clay or terra-cotta coils pieces have the most immediacy. Alison Weld, the exhibition’s curator, compares Mr. Kadish’s rugged handling of clay to the spontaneity involved in Abstract Expressionist painting and this is very much to the point. Mr. Kadish was related to the first generation of Abstract Expressionism; in fact, he attended art school in Los Angeles with Jackson Pollock and Philip Guston. But he is rarely, except for some early graphic work, no abstract artist. When he explores the theme of woman as Earth Mother, he can remind us of Willem de Kooning’s classic work, but try as he might. Mr de Kooning can’t come close w Mr. Kadish as a sculptor. 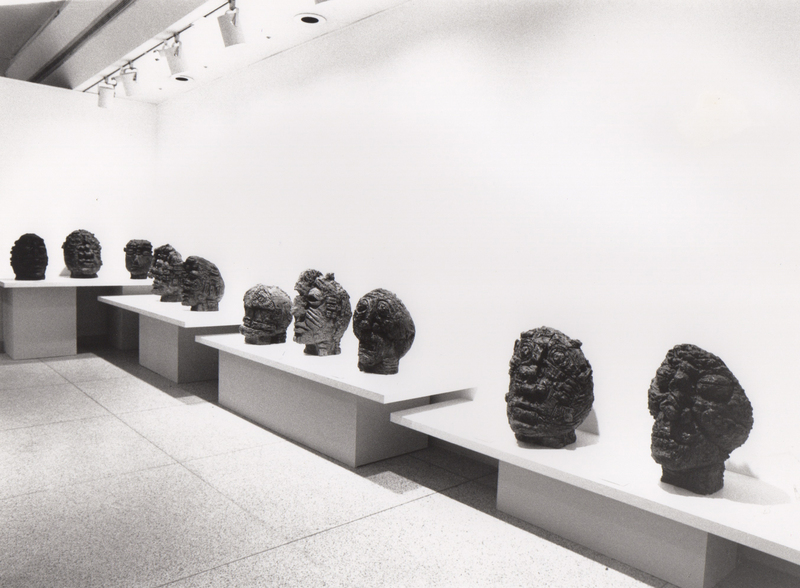 On entering the retrospective, the viewer encounters the lineup of clay heads from the 1980’s; they look more impressive in this array on a low shelf than they would on separate pedestals. 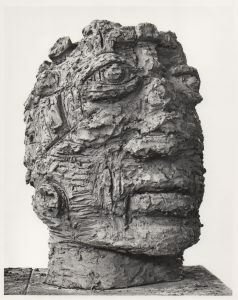 Mr. Kadish alternates heads from the “Holocaust Series” with representations of the head of the golem, the robot-like servant from medieval Jewish literature who snatched bodies. The two series Viler woven make a powerful and ironic narrative. One soon becomes aware that Mr. Kadish’s late graphic work, featuring a stern opposition of black and white. has the same force as his sculptures and deals with myth on the same high level. Here it should be interjected that his California background (Mr Kadish’s family moved there from Chicago when he was led him to such Mexican mural painters as Diego Rivera and Alfred Siquieros, who were exploiting the legends of Mexican Indians. This culture got into Mr. Kadish’s blood. His heads have a strong pre-Columbian pedigree. But, during World War II he spent the years 1943 and 1944 in India with the Army artists unit. The direct influence of this experience revealed itself at the time, but the massive relief sculptures he must have seen in India on the theme of the Earth Mother must have made a lasting impression on him. He has made relief sculpture, mostly in the 60’s and 70’s, that is almost freestanding, with a minimum of wall behind it, as in the Indian works. These pieces look oddly precarious, prompting a young museum goer to compare them to sand castles. More successful, to this viewer, are those relief works on which the plane is the floor. The female figures look more purposefully enticing in that supine position, for the figure is unmistakably identified with the earth. From observation, the exhibition is a great crowd pleaser with more than 250 works. It provides a lot to chew on. And it has been arranged so that shifts in both media and concern keep one attentive. 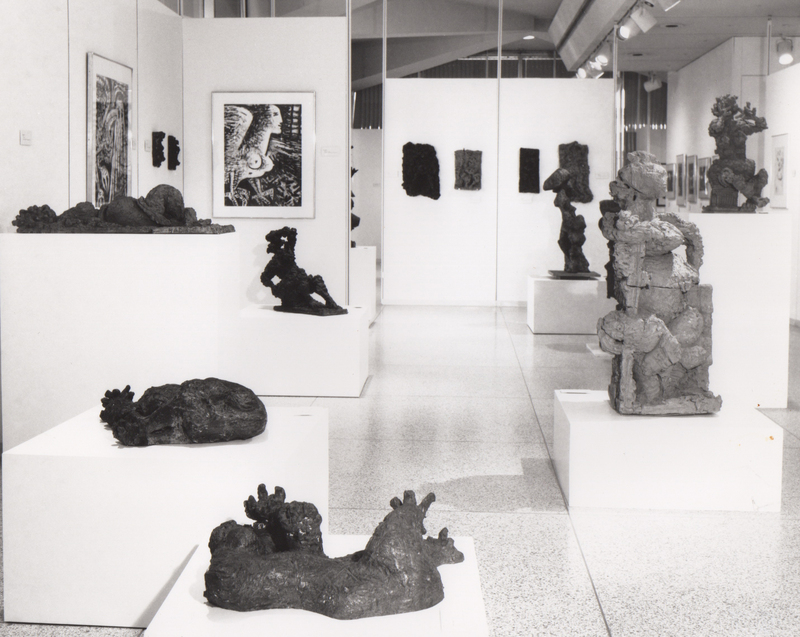 At the center of the gallery is a large vitrine containing numerous small figures from the many periods of Mr. Kadish’s career. Some of them are entitled “Aggressive Personage.” One understands that at its source in these small studies the work has alacrity as well as tremendous shift in scale and heft. When one a arrives at the 1930’s (one appreciates how this show is set up as true backward look), one knows that he is in the bleak Depression era but here one finds the seeds of a lifetime of art. Mr. Kadish began as a painter, but after World War II and about 10 years as a dairy farmer in Vernon, he became a sculptor. No clear explanation is provided for this changeover, but one can imagine that the earthy and very physical nature of dairy farming might have led him to sculpture. At any rate. he still has that New Jersey farm, which qualified him for the second exhibition In the State Museum’s series “Contemporary Arts The New Jersey Context.” He also lives on the Lower East Side of New York City. In three portraits, including two drawings, “Portrait of Mother’s. Friend” (1930) and “Portrait of Enicco Biagio, Alaska Fisherman” (1937). and an oil painting -“ The Artist’s Father” (1933). Mr. Kadish shows a predilection for the roundness and monumentality of form that were to stay with him. In the realm of subject matter, we see in works from the 30’s social concern and what might be called a cherishing of humanity, which have also endured. Most interesting in terms of foresightedness is a drawing for a mural from 1936 called “A Dissertation on Alchemy.” Two large hands are seen molding a palpable substance, perhaps pointing to the future worker in clay. The New Jersey State Museum at 205 West State Stress in Trenton. The hours are 9 AM to 4:45 PM Tuesday through Saturday and noon to 5 PM Sunday.